Hello! Today I have Cupcake Polish 'Berry Good Looking' to show you. I finally bit the bullet last month and pre-ordered myself a bottle of the sought after shade. 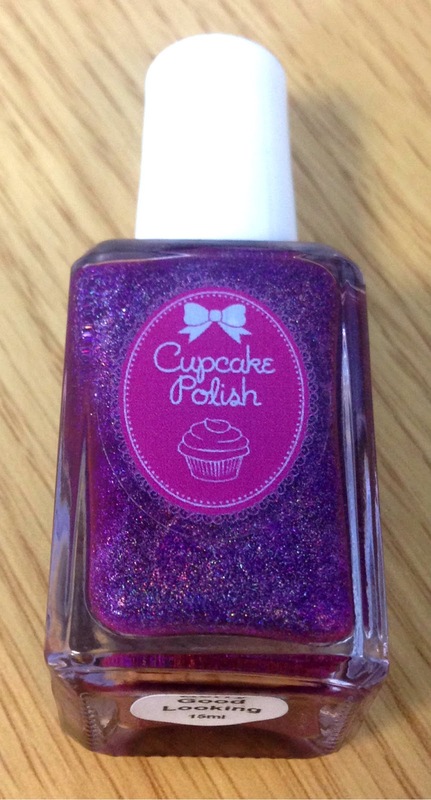 Although I've recently got my hands on one or two others, this is the first Cupcake Polish I have actually worn. As always, read on to find out more! 'Berry Good Looking' is a vibrant royal purple holographic. It forms part of the Berry Patch Collection which released in June 2015. 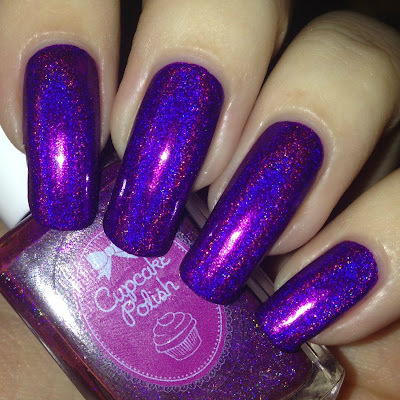 It is still available on the Cupcake Polish website, although I purchased mine from Rainbow Connection here. Unfortunately, I did have some issues with this polish. My bottle is quite separated and even after a good shake you can see darker patches where the pigment isn't fully mixing in. I also found it to be really thick and difficult to apply. It didn't dry down smooth but instead fairly ridgy due to the thickness. With a little bit of dabbing where necessary and careful application, I did manage to get it opaque in two coats. I added a thicker coat of topcoat to try and smooth everything out which seemed to have done the trick. Below is two coats and topcoat. 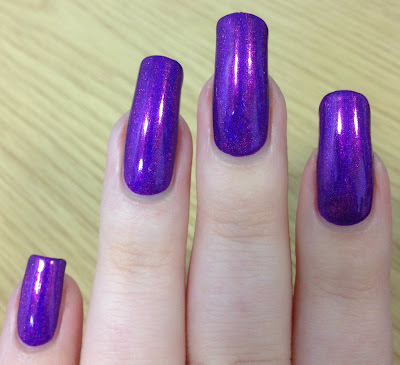 To show the full holographic potential of this polish, I've taken a photo with flash to show the intense flame you get in sunlight (or brighter artificial lighting). Isn't it absolutely gorgeous? I'm glad I finally caved in and ordered, even if I did have formula issues - I think it might just be worth the extra effort! All previous reviews I have read mention a very easy to use formula so I am hoping I have a bad bottle/batch - I have been advised to add thinner for now and will update this post when I know more. 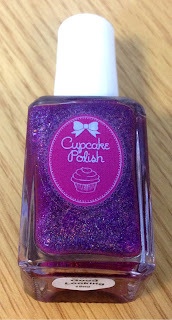 If you have Cupcake's 'Berry Good Looking', I'd love to know what your bottle is like! I've never tried Cupcake, but this and 2 others are on my wish list! Gorgeous! This colour is glorious! I've only tried one Cupcake Polish and I was very happy with it! Gorgeous polish, but sorry to hear you had problems with it.